Decorating Chalks are wonderful for blending colors and achieving soft pastel effects. They can be used for shading in areas, creating backgrounds,coloring in a stamped design, etc. Applying Chalks: Apply the colors using your finger, a cosmetic sponge, crunched up paper towel or a soft brush. Reapply chalk until the desired intensity of color is achieved. Stray marks can be erased with an art eraser. Blending/Shading Colors: For shaded areas begin with the lightest color, moving to the darker, blending the edges of one color directly over another to achieve a third color. There are endless possibilities for colors and blends. Finishing Your Project: If desired, use a spray fixative when finished to keep chalk from smearing. This will also deepen the colors and add sheen. Chalk art makes a wonderful background for stamped projects. For a streaked background, such as a sunset or sunrise, start near the center of the card and streak the colors outward. Combine several colors. Pull your finger or a sponge from the center out to the edge. Apply one color at a time, spacing the streaks as desired and then blend colors. Stamp the scenery elements on afterwards. (You may find matte finish paper to be the best choice for blending chalk colors.) An alternative for this technique is to cut a mask, covering the center area of the card. The streaks will appear to radiate from a center white area. Marbled background: Put about an inch of water into a pan slightly bigger than your card, With a knife, scrape chalk dust of several colors onto the surface of the water. Lower the paper flat onto the surface of the water to pick up the color, immediately lifting the card back out of the water. Allow to dry flat. If your paper develops puckers, it can be ironed to flatten it back out. CHALK ON DARK PAPER: Create stunning cards using dark paper. Stamp and emboss a stamp using white or metallic embossing powder onto dark colored cardstock. 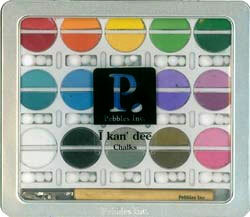 Color the inside areas with a heavy application of chalk, achieving a suede-like texture. Silhouette Paper can also be used to get the most contrast. CHALK WITH THE BLENDER PEN: Chalk colors can be beautifully blended with the blender pen, which also "sets" the chalk, eliminating the need for spray fixative.